I’ve completed my first two projects for the gift along! First, is pdxknitterati’s Kilter. I used Malabrigo Silky Merino in Lavanda. It turned out very nice! I was a little worried that I’d run out of yarn, so I sped up the crown decreases a bit. Here’s a shot of the back. I can see my decreases were a little loose, but I’m okay with it anyway. My second finished project is an Abundant Cowl by mangobadango. I used Knit Picks Preciosa in the Crest colorway. This is a very soft and squishy yarn. It’s a single and reminds me of Malabrigo Worsted – maybe a bit thicker. It was a very easy knit and I finished in two days! I’ve cast on for two more gift along projects. First is the Mount Rundle Mittens by Kate Bostwick of Cowtownknits. I favorited this pattern the first time I saw it and I am loving it! I had a bit of a struggle at the beginning – knitter error – but am moving along with ease now. 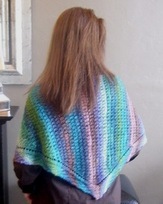 I’m using Knit Picks palette in Regal and Tranquil. I’m very happy with the color contrast! I can’t wait to finish the first mitten. Maybe tonight? I don’t have a picture of the second cast on. I plan a feature of the designer though, so I’ll save it for a separate post! In the meantime, Bridget is keeping busy. 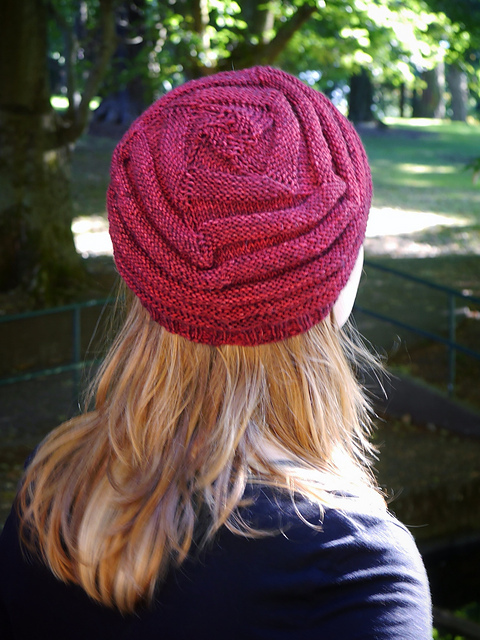 Tomorrow night, I will kick off the gift along by casting on a hat by Michele Bernstein, pdxknitterati on Ravelry, so I thought I’d introduce her and some of her designs here! 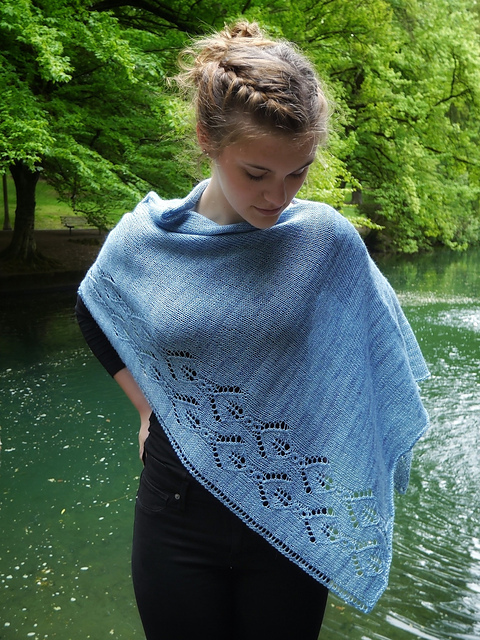 I asked Michele which patterns of hers she really loves and she mentioned two patterns for ponchos – Tilt Shift and Summertime Blues. I love the cabled edge on Tilt Shift and Summertime Blues has just enough lace to be interesting without being overwhelming in the way that lace can sometimes be. While “poncho” made one think of 70’s retro not too long ago, they are making a big comeback this year! Michele likes how handy they are to wear when you really need both hands for something. They may not be doable for the gift along, but they are definitely something to keep in mind for January selfish knitting! Be sure to check out Michele’s bundle on her designer page HERE. She has lots of great designs to inspire you! Michele blogs at www.pdxknitterati.com about knitting, teaching knitting, and traveling. I am once again participating in the Indie Designers’ Gift Along this year! There are even more designers (over 300!) participating so that means lots and lots of patterns for sale. The sale and the gift along officially kicks off THURSDAY NIGHT at 8PM EST. 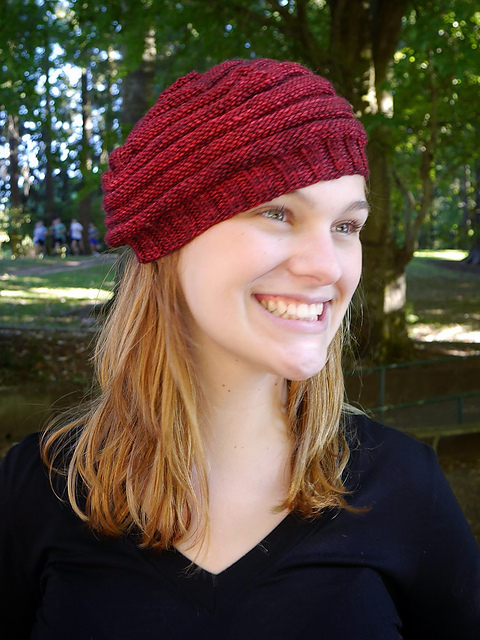 All of my paid patterns are on sale for 25% off using the gift along coupon code – which I will post on Thursday. The sale lasts for one week only. Designers can include up to 20 of their patterns for sale. You can participate in the gift along by knitting any paid patterns (meaning not free) by any of the designers. You can use patterns you’ve already purchased or patterns that aren’t on sale…as long as the pattern is not free, you can knit it and your project will be eligible for prizes. Prizes! Lots and lots and lots of prizes! From downloadable patterns (each designer gave at least 5 coupon codes for free patterns) to tangible, real life items…such as YARN. I won yarn in last year’s gift along! There are several new patterns up there! Top row: (all new in the last few months) Slip Sliding Hat, Las Moracitas Hat and Cowl, and Bricktown. I have seven more patterns for sale as well. See them all in my Gift Along Bundle. It’s been over a year since my last post and I’m ready to start blogging again! I could list a million reasons or excuses for not blogging, but what it comes down to is, I just didn’t take the time to do it. So…here I am, taking the time. Today, I’ll just show you some of the many projects I’ve knit in the last year. Mittens for my friend, Karen, who is afraid doesn’t like to knit anything stranded. 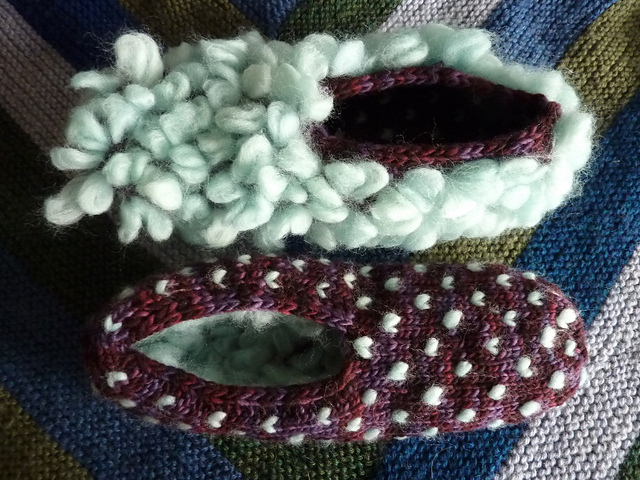 She kindly paid me in yarn to make these. They are the Hickory Mittens and are not an easy stranded pattern, with up to 4 colors per row. Yarn used was various shades of Cascade 220. A couple pair of Spiced Cocoa Mitts. The blue pair was for my mom and the gray pair was for Susie, the colleague at school whose name I drew for Christmas. Yarns used was Berocco Vintage for the blue mitts and Universal Yarn Classic Shades for the gray. Lichen shawl/scarf for me. Yarn is Schoppel-wolle Zauberball 100. This was for Camp Loopy last year. Next is a pair of Nord of Dwindling Frost mittens using Tosh DK in Worn Denim. 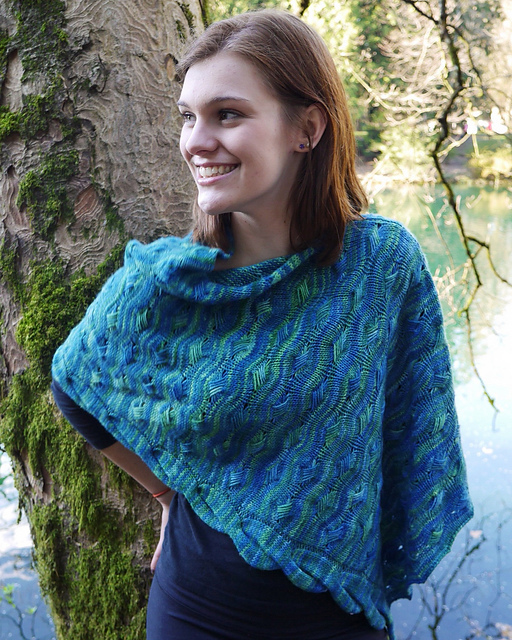 Most recently finished is this Nurmilintu in some handspun gradient yarn. I didn’t spin it myself, but had someone on Ravelry spin it for me! I used up all but about 10 yards. That’s all for now! I’ll be back in a few days to post some pics and details about a few patterns I released in the last year! Yarn: Cascade 220 Sport. I used only 1 skein of the black for both turtles – I still have a little left, actually. You could probably knit two turtles in reverse color from two skeins. Size: Head to Tail: 9 inches. The shell is 4 inches wide and 5 inches long. Started: Pink & Black was started in February sometime. Orange & Black was started on May 24th. Finished: Pink & Black was finished in March. Orange & Black was finished today! May 31st. I love the finished product but I was a bit annoyed with the pattern. I’d never done needle felting before and really had no clue as to the organs of a frog. The pattern simply stated, “needle felt some innards and sew them down.” No diagram, no instructions as to what colors to use, or what organs to needle felt. I looked up diagrams of dissected frogs to decide what to do. It was a challenge, but my colleague says I did a pretty decent job, and she was thrilled! It is now displayed in her classroom. Pattern: Biology 101 by Emily Stoneking. Yarn: I think the green is Berocco Vintage, but I’m not sure. It was a leftover without a ball band. The guts were needle felted with random roving scraps. I had to buy a small package of roving for needle felting to get some of the colors though. Needles: I don’t remember. Probably 6s, knowing my gauge. Started: Over Christmas Break 2013. In the meantime, here is the Christmas gift. The pattern is Crown Royale by Mickie Swall. It is a free pattern on Ravelry. It is a very straightforward and easy pattern. 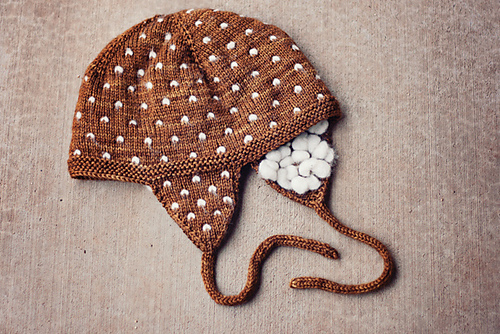 You knit the cabled brim first, graft the ends together, and then pick up stitches along one edge to knit the body of the hat. The cluster stitch adds texture and keeps you from getting bored. The recipient has lovely black curly hair. I think berets look especially good on people with curly hair. On me with my straight, flat hair….not so good. Cast On: Sometime in December. Finished: Before the Christmas party! My knitting friends and I all jumped on the bandwagon that is the Jeweled Cowl. We spent our last knit night matching yarn (Malabrigo Lace, of course) to beads. I already had both at home, so I just enabled helped others decide. I cast on as soon as I got home that night and it is coming along! I am using the Polar Morn colorway with some lovely deep sea blue beads. Even though it’s extremely easy, it is an addictive knit. On one row, you knit the yarn overs and decreases; on the next row, you add the beads. The rest of the cowl is knit in stockinette. Super simple. I also cast on Molly using Malabrigo Arroyo, which is sport weight. The pattern calls for Worsted, so I upped the stitch count. I’ll deal with adjusting the decreases when I get there. In the meantime, the Arroyo is showing the stitch definition and the cable beautifully. The colorway is Candombe. Bridget wanted to make her second appearance on the blog. Well, since I can’t knit much, I have nothing new to show except for some new yarn! I can buy it, I just can’t do anything with it yet. Koigu KPPPM in color #P541. I love this! Various shades of blue-green-teal with some yellow, orange and brown mixed in. It’ll make a lovely….something. Socks? Shawl? Meet Bridget! She’s 1 year old and is so sweet and cheerful. We got her from Pet Smart and the agency that we adopted her from rescued her from a shelter. To think she would have been euthanized….shudder. It’s been several months since we lost Tiger, but we finally decided we were ready for a new kitty. Mike works from home and missed having a “buddy”. Bridget is officially his cat and she knows it! I did finish some socks before the accident, however. These are for another student at school. I was only going to make one pair – for the winner at our annual auction, but the mother of this boy begged me to make him a pair too. She wanted to let the other student win since it was her last year at our school – and since I’m a sucker and I love my students – I agreed. He asked for “neon green with 3 black stripes – not too thick and not too thin”. I think I nailed it. I bought Knit Picks Stroll in Bare and use 8 packets of Lemon Lime Kool-Aid to dye the yarn. The black is Cascade Heritage Sock. I told him that he was getting a black stripe right before the toe so I’d have something to look forward to while knitting the foot. If they look really long, that’s because he wears a size 10! Fortunately, his feet are skinny, so I still used a 64 stitch cast on. I used the jogless stripe method of slipping the first stitch on the row after a color change. It wasn’t perfect, but looks okay. Somehow, I didn’t weave the ends in very well on one stripe. Very frustrating! I fixed it though and it looks okay. It’s a little lumpy on the inside, but he says it doesn’t bother him. Pattern: None – I used a 64 stitch cast on and the numbers for heel from Cookie A.’s Sock Innovation. (The heel table in the book is worth the price of the whole book!) The stripes are 5 rows wide. Yarn: Knit Picks Bare – dyed with Lemon Lime Kool-Aid. Cascade Heritage Sock in black. Started: Sometime in early September. It’s still sad not to end with a Tiger picture and quote. Possibly soon, you will see someone new to end the blog! For now though…too much typing. I know…the title doesn’t fit the time of year. I just realized that I never blogged about my sock pattern from this summer! Fly Into Summer features an easy but fun to do butterfly stitch which is excellent for some hand painted yarns. I don’t think I’d use a wildly variegated yarn with this pattern, but something with color changes such as the Lorna’s Lace’s Shepherd Sock that I used would be excellent. The colorway is Fresh. The sock is knit top down and the pattern comes in three women’s sizes. Goodbye, Tiger. You were the BEST KITTY ever. We will miss you so much!